It’s not a case of bloggers’ block that’s kept me away for so long; it’s a lack of intriguing campaigns. But, just as I was about to give up hope… Weight Watchers opened the door to a very interesting concept. The weight-loss company has launched its first ‘Feel Good’ café in London, and social media is the key to getting in. In exchange for spreading the ‘feel good’ message, customers can pick their favourite healthy dishes – for free. It’s a bold and brave approach to hospitality, but it’s not the first time we’ve been bribed with freebies for a Facebook update. Remember Special K‘s Tweet Shop? Weight Watchers’ café, based in Hoxton Square, may only be open for a week, but it is something the the brand will consider rolling out nationwide if it’s successful. After all, tasting is believing and if people choose its meals when eating out, then they’ll definitely purchase as part of their weekly shop. It’s a win-win. So, don’t be fooled. Even if you leave feeling good, the Weight Watchers’ empire will feel better. Don’t get me wrong. This is a breakthrough initiative for the weight-loss industry, as Alex from Social Media Frontiers says. And, for a brand which already commands considerable shelf space in supermarkets, this really was the only direction to go in. Sure, it could’ve partnered with an up-and-coming coffee chain but where’s the fun in that? Big brands don’t tag-along if they’ve got the pulling power to lead from the front. 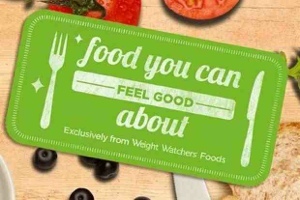 My only critique is that the café launch should’ve coincided with Social Media Day (June 30), but Weight Watchers has a good excuse – new research which highlights the dieting challenges the UK faces, and the café is part of the answer. The only other question is, how will Slimming World respond?